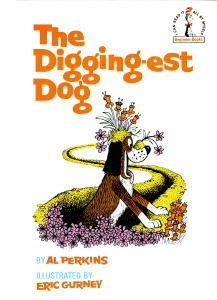 Kiddo loves The Digging-est Dog by Al Perkins and Eric Gurney, but I’m not so crazy about it. Unfortunately, the remainder of the story has myriad problems from an animal welfare perspective. First, the boy must purchase the dog’s freedom, essentially supporting the industry that has neglected and abused him. Second, the dog has to live outside in a doghouse instead of being welcomed into the family home. Plus, the book portrays the boy milking a cow — with no mention of what has happened to her calf. The worst part, however, occurs when the boy teaches the dog to dig and the dog happily digs, digs, digs all over town. In precisely this moment of bliss, the boy scolds the dog and threatens to send him back to the pet store. The frightened dog responds by (literally) digging himself into a huge hole. Thank goodness this story has a happy ending, in which the boy and the neighborhood dogs rescue the dog in the hole. Still, I have to admit that every time kiddo pulls out this book, I cringe. Ages 4-8. For other reviews, visit Goodreads. This was one of my favorite books as a kid, but I noticed all of the same issues when I revisited it while reading it to my daughter. At least it portrays the pet shop as a nasty, evil place… that’s somewhat progressive for the era this book was written in, right?